"Because they're the same [bleep]ing bill. [Romney] just can't have his cake and eat it too. Basically, you know, it's the same bill. He can try to draw distinctions and stuff, but he's just [purposely misleading]." Jonathan Gruber compares the ACA to Romneycare, November 2011. 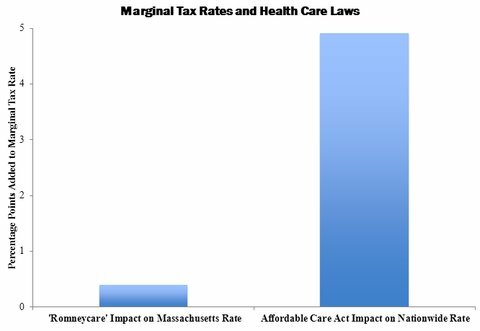 "the Affordable Care Act will, by 2015, add about twelve times more to average marginal labor income tax rates nationwide than the Massachusetts health reform added to average rates in Massachusetts following its 2006 statewide health reform." Casey B. Mulligan, August 2013.